"The Green Howards Drum Majors"
D/Maj A. Balchin 1932-1939 From the Coldstream Guards, Sgt Wood took over during the out break of WWII. 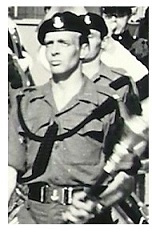 D/Maj J. Woodcock 1948-1949 Was D/M with the 2nd Bn. from India to Khartoum. Remembering that the 2nd Bn (Khartoum) became the present 1st Bn. When reducing infantry levels the 1st Bn in UK was disbanded and the 2nd Bn (difficult to de-kit in Khartoum) renamed the 1st Bn. Both sets of Colours made the necessary 'swop' sea journeys, one set to be laid up. This caused endless squabbles - Topper Brown was one because he was 2nd Bn - when the 2nd Bn was re-raised in 1952, being called the '2/2nd' Bn by such people as the late Lt Col Don Stowe. D/Maj W. Drake 1976-1982 WOII went to be HQ CSM. 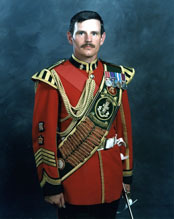 D/Maj R. Purvis 1989-1993 Posted to Jnr. Soldiers Harrogate, until discharge. D/Maj A. Daniels 1993-1994 Posted in from The Guards. 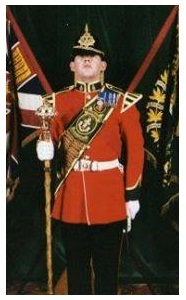 D/Maj R. Williamson 1994-1996 Richard left to serve for a year at the Infantry Gunnery School and then left the Army. Plt Comd then CQMS HQ Coy, CQMS Kings Div at ITC Catterick then to RRT 1GH ( 2 YORKS as of 6th June 2006). 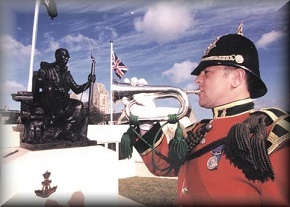 D/Maj S. Elstob 2005- to present Sgt D/Maj. 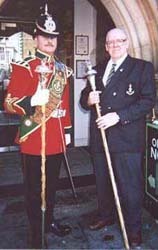 When Drum Major Birbeck joined the 1st Bn. there was no Corps of Drums as such within the Bn, during the war Ginger Gates started to form one, then he was demobbed. Nobby Noble was drafted in and carried on until 1949, he was transferred as D/Maj to the York & Lancs, we were sent to Khartoum as the 1st Bn. Cadre. When they arrived the great majority of the Drums were due for repatriation, so except for D/Maj Woodcock and six drummers that's all what was left. 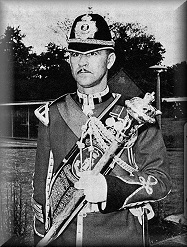 After posting to Malaya he was asked to assist Woodcock to reform the Drums, rightly or wrongly he refused as he had gone to Khartoum to be the Drum Major. 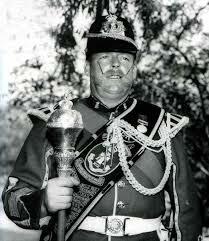 However after a few months he was confirmed as Drum Major from 1950. 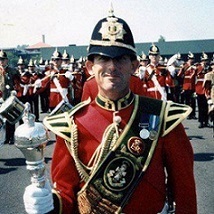 In 1952 he committed a "Faux Pas" in other words he was drunk on a retreat beating in Malacca, the Drum Sgt G Bryan took over in 1952 until 1953, he was also transfered to the Yorks & Lancs. A Birbeck returned to the 1st Bn. in Minden and resumed the roll as D/Major. He was promoted to C/Sgt as D/Maj and then to WOII, when D/Maj Topper Brown took over in 1957, this explains the reason A. Birbeck pops up now and again.